Even the most unpredictable and audaciously led lives, when observed from a distance, form patterns and fall into cycles. This is a fundamental truth that underlies all human existence, whether individual or collective. For Maximilian Büsser and MB&F, creative energy comes in seven-year cycles. 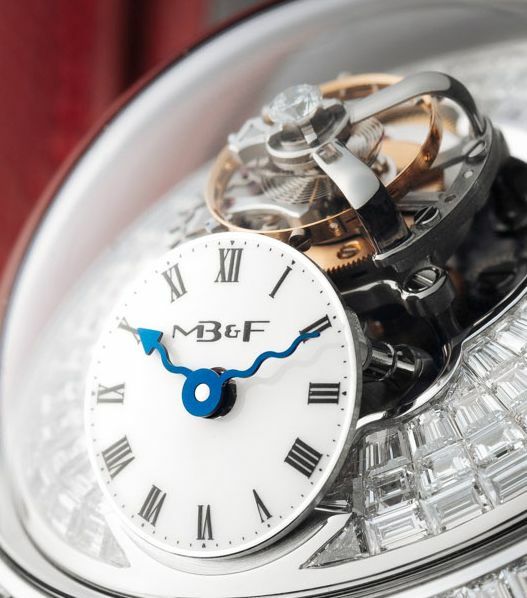 It was in MB&F's seventh year that the Legacy Machine collection was born, that the first M.A.D.Gallery opened in Geneva and opened the door to the MB&F co-creations. The 14th year of MB&F unveils a new avenue of horological exploration, an evolution of creative horizons for founder and company alike. 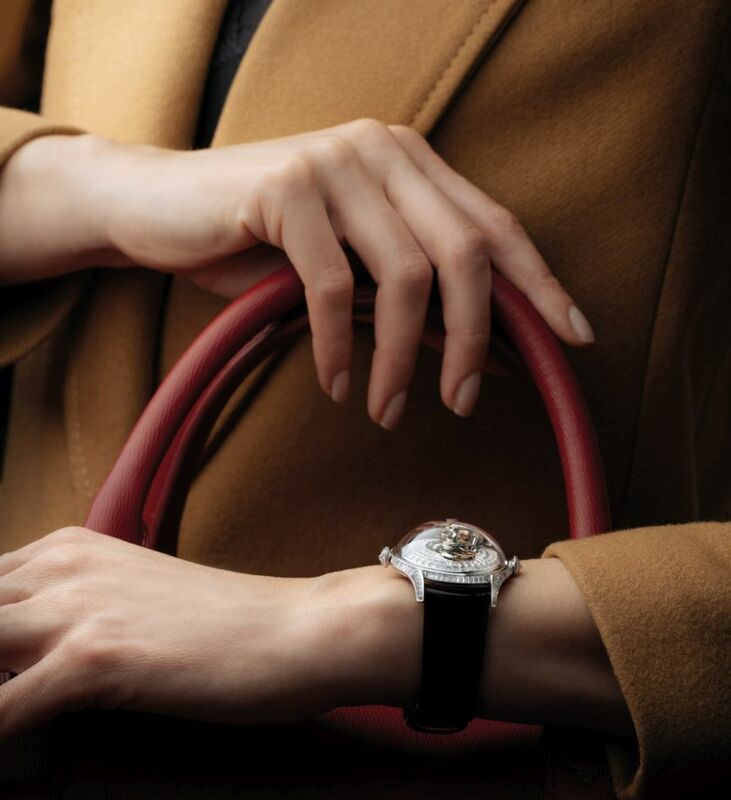 A round case in white gold, with a steeply cambered bezel and slender, elongated lugs, is fully set with diamonds. 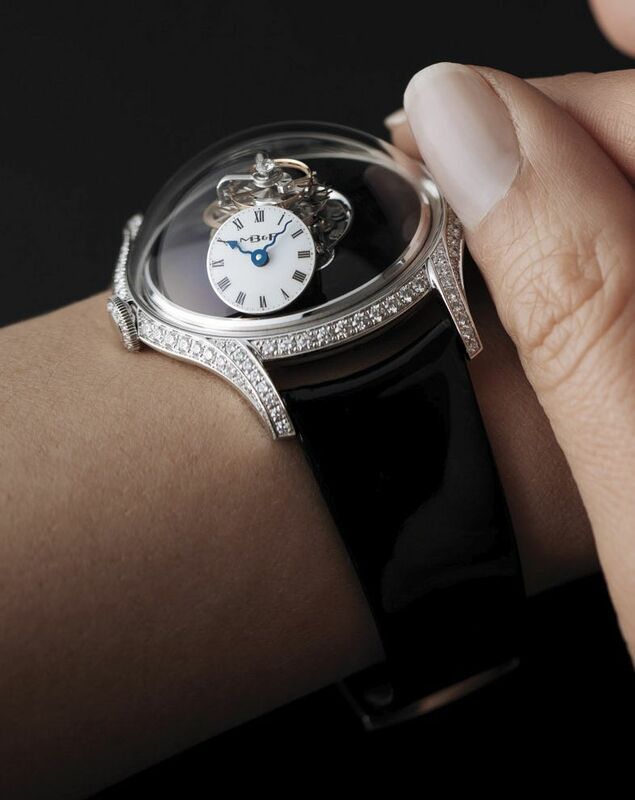 A high, extravagantly convex dome of sapphire crystal rises from the bezel. Beneath the dome, a subtly curved dial plate, liquidly black with layers of stretched lacquer or glittering with blazing white diamonds. An asymmetric ventricular opening in the dial plate frames the heart of the LM FlyingT engine a cinematic flying tourbillon that beats at a serene rate of 2.5Hz (18,000vph). 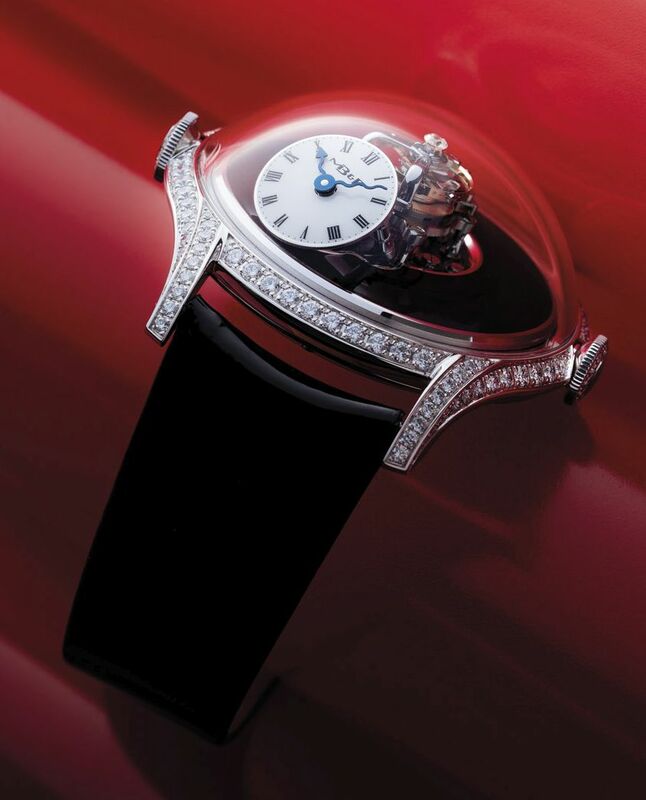 The tourbillon projects high above the rest of the engine, a kinetic, dynamic column that stops just short of the apex of the sapphire crystal dome. Affixed to the top of the upper tourbillon cage is a single large diamond that rotates simultaneously with the flying tourbillon, emitting the fiery brilliance of the very best quality stones. At the 7 o'clock position another reference to the numeric theme that runs throughout LM FlyingT is a dial of black or white lacquer that displays the hours and minutes with a pair of elegant serpentine hands in blued gold. The dial is inclined at a 50° tilt so that the time can be read only by the wearer, an intimate communication that highlights the personal nature of LM FlyingT. 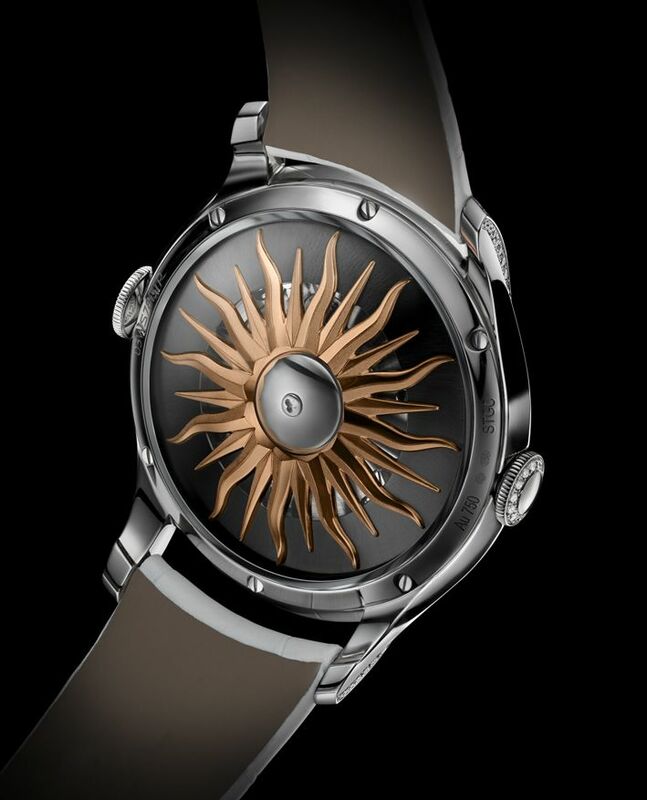 On the reverse, the automatic winding rotor takes the shape of a three-dimensional red gold sun with sculpted rays, providing LM FlyingT with four days of power reserve. The design of Legacy Machine FlyingT is replete with associations drawn from the feminine and maternal influences in Maximilian Büsser's life. Says Büsser, "I wanted LM FlyingT to possess the epitome of femininity as reflected by the women in my life, particularly my mother. It had to combine supreme elegance with tremendous vitality. The column-like structure of the flying tourbillon was very important to me as I felt very strongly that women form the pillar of humanity. At the same time, there is another layer of meaning coming in from the sun-shaped rotor, which incorporates the element of life-giving, a source of sustenance which we gravitate towards and around." 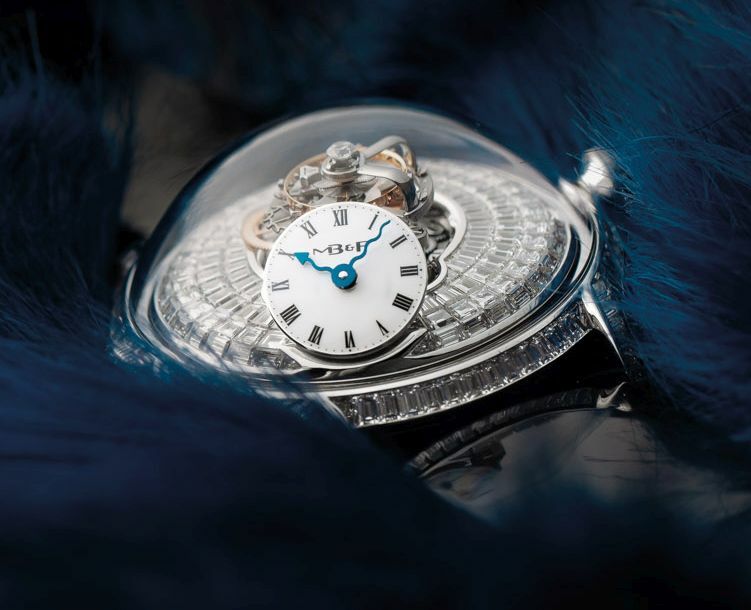 - dial plate and case both fully set with baguette-cut diamonds. The creative process behind Legacy Machine FlyingT started four years ago, when Maximilian Büsser began thinking about making something inspired by the feminine influences in his life. Says Büsser, "I created MB&F to do what I believe in, making three-dimensional sculptural kinetic art pieces that give the time. I was creating for myself, which is the only way we could have made all these crazy and audacious pieces over the years. But at some point there came a desire to create something for the women in my family. I've been surrounded by their influence all my life, so I gave myself the challenge to do something for them." Inspiration came from the combination of seemingly incompatible qualities that characterised the greatest feminine figures in Maximilian Büsser's life. Elegance was key, but so was an infectious energy that could captivate an entire roomful of people. The lines and composition of Legacy Machine FlyingT epitomise these qualities, being as refined and pure as any other Legacy Machine, but with the dynamism and exuberance of a central flying tourbillon. The intimate and personal nature of LM FlyingT led to the ultimate placement of the time indication at the 7 o'clock position on the dial plate, with the black or white lacquer dial tilted 50° to face the wearer. The message is subtle but clear that whoever the owners and wearers of Legacy Machine FlyingT may be, their time belongs to them and no one else. "The last thing I wanted to do," says Maximilian Büsser, "was to take a masculine timepiece, resize it, put a different colour on it and call it a ladies' watch." Each MB&F creation is drawn together in a complex process that is equal parts original Max Büsser concept, design finesse by Eric Giroud, and mechanical ingenuity by the in-house technical team. 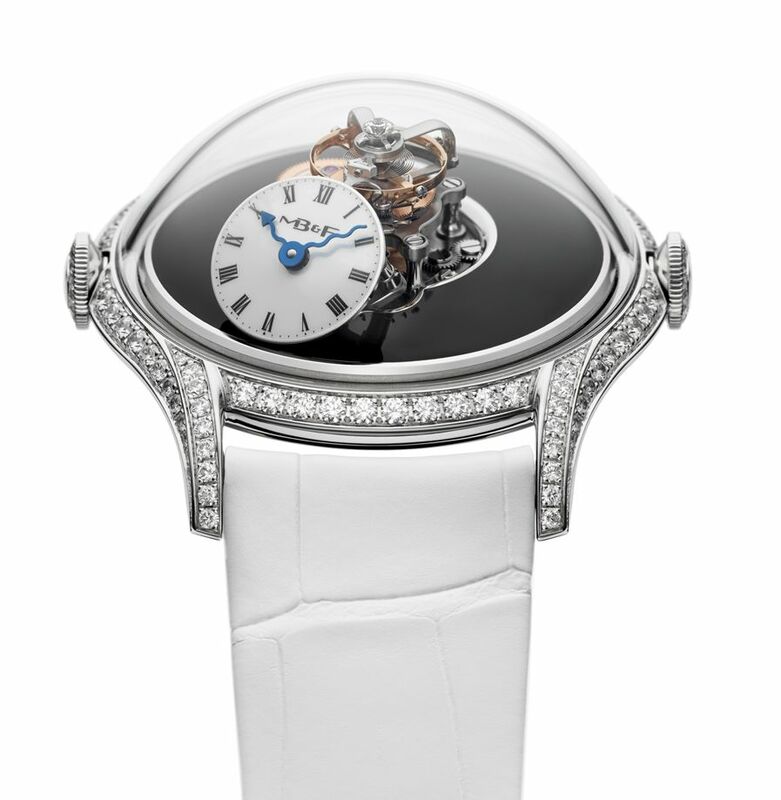 The case, in 18kt white gold and diamonds, measures 38.5mm x 20mm. It has a high domed AR-coated sapphire crystal, a sapphire display back, and it is water resistant to 30 meters. 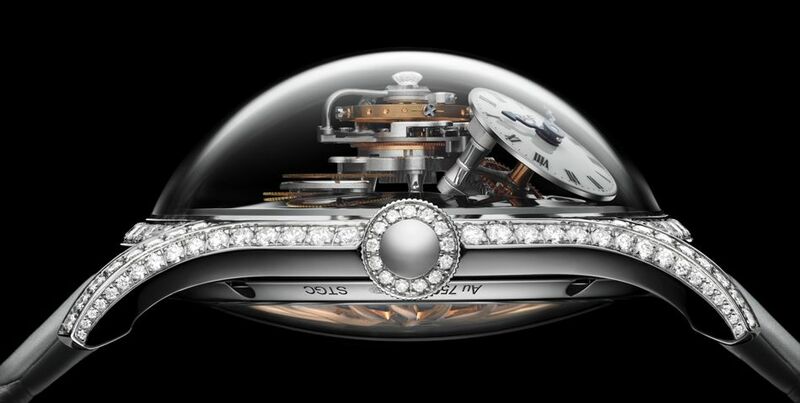 Movement is a Swiss automatic MB&F in-house caliber with 30 jewels, 18,000 vph and a power reserve of 100 hours. 3D vertical architecture. Central flying 60-second tourbillon. 3D sun winding rotor in 18kt red gold, titanium and platinum. A distinct challenge which arose in the construction of LM Flying T was the shape of the upper tourbillon cage, which creates more mass on one side of the tourbillon than the other. 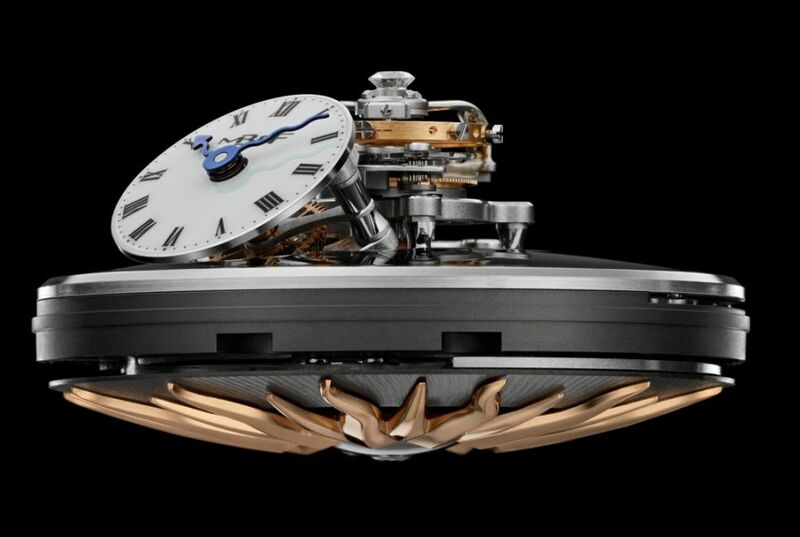 In order to compensate and ensure that the mechanism remains balanced, a counterweight was hidden under the tourbillon carriage, on the opposite side of the upper tourbillon cage. Functions/indications: hours and minutes displayed on a 50° vertically titled dial with two blued serpentine hands. Two crowns: winding on left and time-setting on right. In order to display the time as precisely as possible on the 50° inclined dial, conical gears were employed to optimally transmit torque from one plane to another, a solution first used in HM6 and subsequently in HM9 Flow. 168 stones (120 on the case, 21 on the buckle, 1 on top of the tourbillon cage and 26 for the crowns). About 1.7 carats. 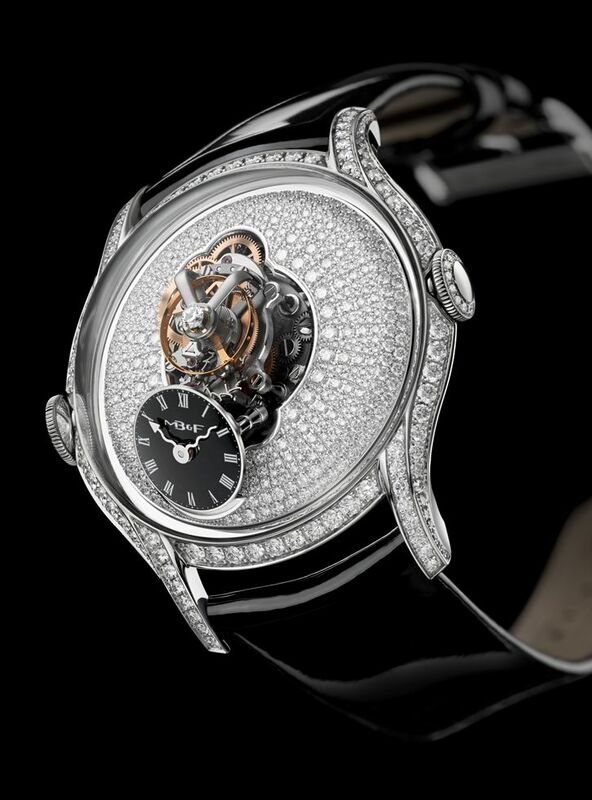 558 stones (390 on the dial, 120 on the case, 21 on the buckle, 1 on top of the tourbillon cage and 26 for the crowns). About 3.5 carats. 294-baguette diamonds and 3 stones (134-baguette diamonds on the dial, 124-baguette diamonds on the case, 12-baguette diamonds on the buckle, 24-baguette diamonds and 2 stones for the crowns, 1 stone on top of the tourbillon cage). About 8.2 carats. It comes on a calf or alligator leather strap with an 18kt white gold pin buckle, set with diamonds. Does not seem practical to wear but it is definitely a work of art. 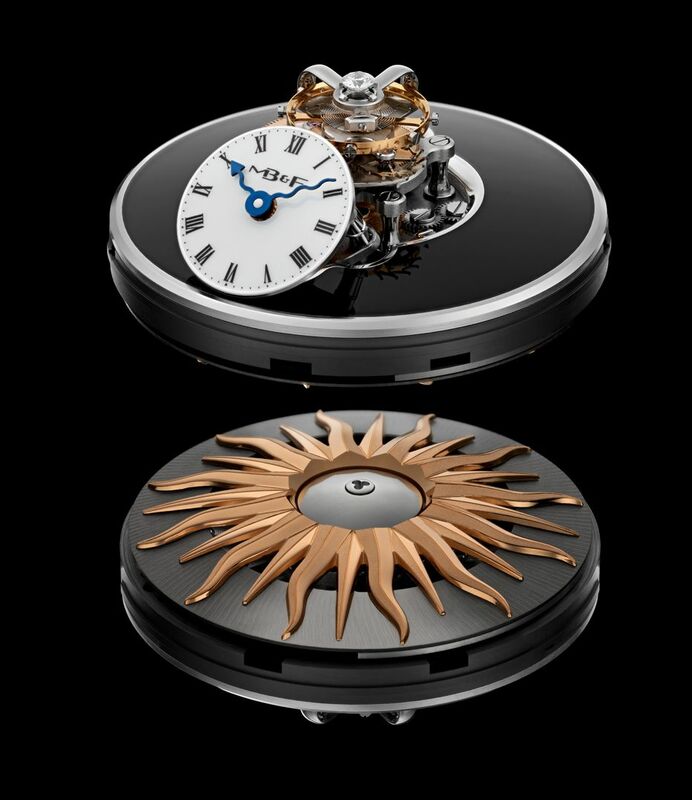 Watch companies are very creative with their tourbillon models.